Cinque Terre is a tourist destination nestled in a corner of the mountainous coastal area of the Italian Riviera or Liguria region. Genoa is the capital and Liguria borders France to the west, Piedmont to the north, Emilia-Romagna and Tuscany to the east, and it sits on the Ligurian Sea (Mediterranean). If searching for it on a map, it’s at the tip of a sideways “u” at the top of the country. Cinque Terre translates literally to “five earth.” Riomaggiore, Manarola, Corniglia, Vernazza and Monterosso al Mare comprise the five villages or towns on this strip of Italian coast, all similar but distinctly different in size and personality. Colorful homes in varying shades of yellow, orange, pink and red with green shudders and balconies–some painted, some real–characterize much of Cinque Terre. While nearby Portofino serves as a shopper’s paradise for the pretty people, Cinque Terre provides a more low-key retreat from the big city for travelers on a budget. It’s got a chill vibe that caters to backpackers, young families and a sprinkling of retirees. People venture to Cinque Terre to hike the terrain at sunrise, relax at the plentiful beaches and taste the rich Ligurian flavors. All will leave you yearning for just one more day on your trip. The towns are about 10 minutes apart by train or boat, making it easy to see one place–or five–depending on your pace. Unless you plan on renting accommodations for the week, Cinque Terre can be easily conquered in a day and a half and is accessible from Milan by train (3 hours) or car (2 hours). While the Italian Riviera has a reputation for playing second fiddle to the French Riviera, in Cinque Terre you will find meticulous, terraced vineyards carved into the hillside along with fern, olive and lemon trees and magnificent mountain and sea views wherever you choose to base yourself. 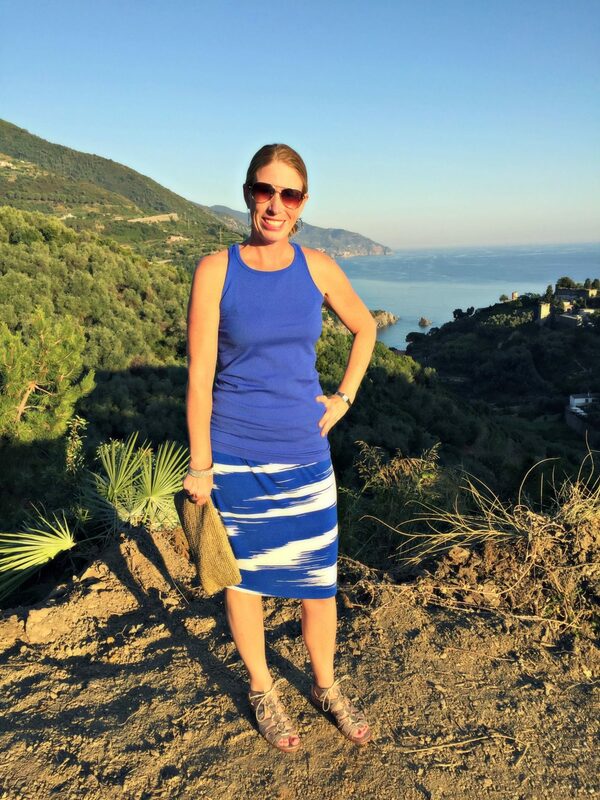 My mother and I stayed at La Cabana, a bed and breakfast in Monterosso al Mare, high in the hills with a view of the terrain and out to the water. 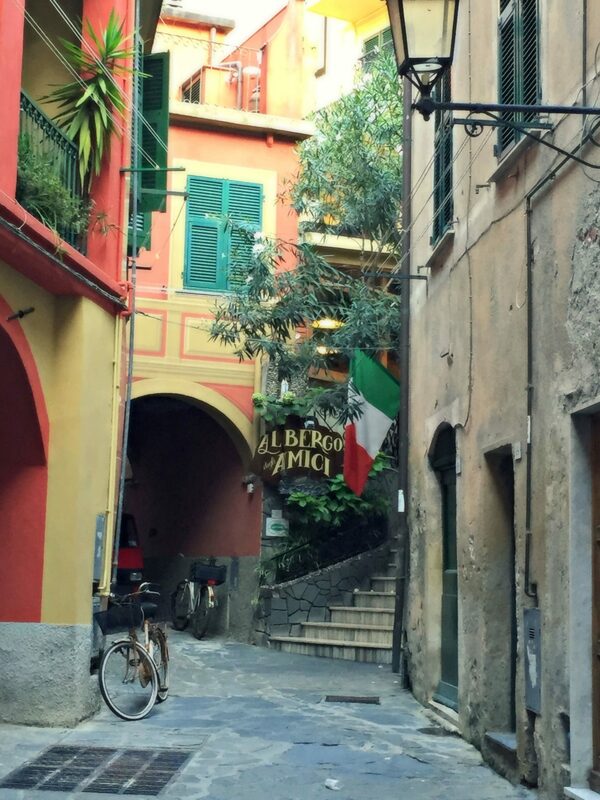 Monterosso has a long promenade connecting the New Town (Fegina) to the Old Town (Centro Storico) and is relatively flat making it easy to browse some of the tourist shops or wander a couple of the historic churches and the local cemetery. Overall, there isn’t much to do but lounge on the beach, swim, hike, eat and embrace the heat. 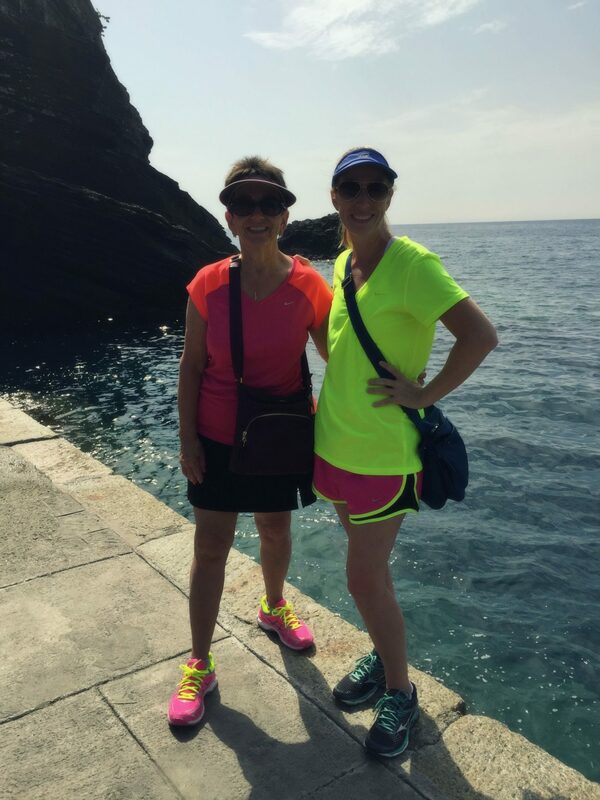 Since my mother is battling a hip injury and hiking was not an option this trip, I ventured through the trails of Monterosso on a 45 minute loop through local vineyards and winding paths to find rocky and uneven surfaces and steep and challenging stairs. The sunrise over the mountaintop and the sweeping views of the coast were well worth the work, but when done, I retreated, thankful that my mother’s looming surgery provided me with an excuse to skip the more laborious trails. As is always the case, the Germans and the Brits came equipped with polls, gear and attire worthy of the most treacherous paths. But like true Americans, Joyce and I came to Cinque Terre for the food, armed with bottomless stomachs and our taste buds calling. Liguria is known for its anchovies, seafood salad, pesto, pecorino and Parmesan cheese, white sauce never red, focaccia and white wine. The fresh pesto adorning homemade pasta or lightly basted on pizza will forever leave me scarred for any other food. To say it melted in my mouth is one thing, to admit it danced on my tongue and left me hankering for more is quite another. We lunched beachside at Ristorante Belvedere where the house specialty, a fish soup, receives rave reviews. We opted for the plentiful seafood salad and it tasted fresh and tasty. Don’t miss Ristorante Miky (closed Tuesdays) for its ambiance, service and traditional dishes. Miky delivered our favorite meal of the trip so far. 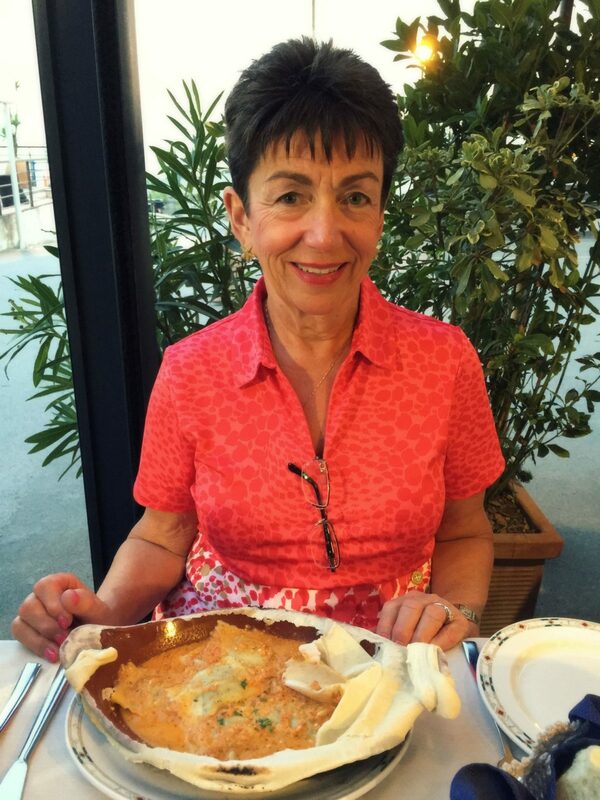 Joyce devoured the seafood ravioli and I inhaled the branzino, prepared local style with olives, pine nuts and potatoes. The stuffed mussels starter proved to be a surprise and our bottle of white wine Friulano paired with our food perfectly. If you fancy dessert, try the mint cream (basil) and berries. You won’t be disappointed. Lastly, we followed Rick Steves’ suggestion and booked a table at Cafe Tortuga (closed Mondays) on the cliffs of Monterosso. While the service lacked, the restaurant more than made up for it with delicious, flavorful, well-prepared food. Per our server’s recommendation, we ordered local pasta–pesto lasagna for me and mussels and broccoli for Joyce. The turbot fish for two as a main course prepared with olive oil, olives and potatoes finished us off for the night. A day later we still cannot decide who won the pasta food wars. If you find yourself around town and hungry, skip the gelato–it’s tasteless. Instead head directly to the bakery and order a pizza, olive, onion or sage focaccia. Every bite is like a step closer to heaven on earth. Make a meal of it or share if you dare. It’s absolutely worth the calories, the carbs or the extra five minutes on the treadmill. Cinque Terre is fun to explore and worth a short stay. The towns are simple, sweet and incorporate a slice of the past–each with their obligatory castle and local church–with a touch of the present. The promenades, filled with restaurants, bars and beachgoers are basic yet inviting. 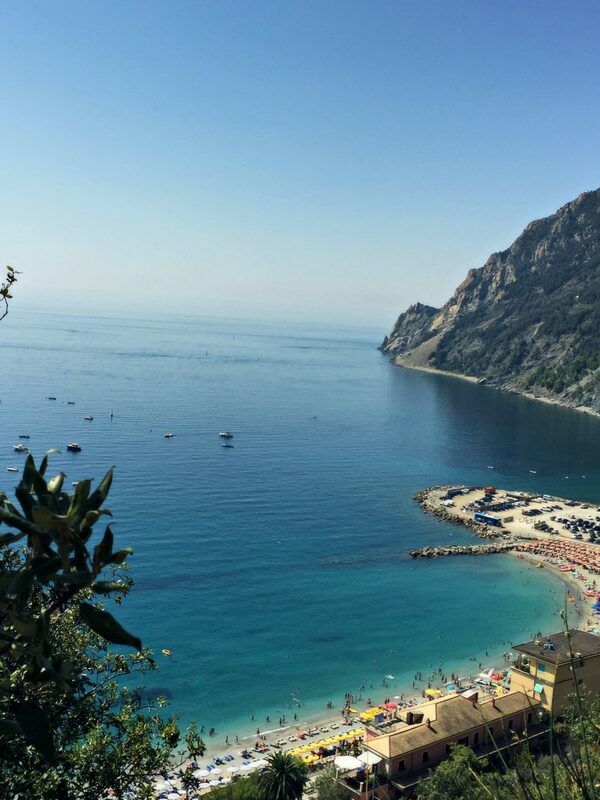 We enjoyed our stay in Monterosso and short visit to Vernazza but check out Cinque Terre for the views and stay for the local kindness and the delectable food.